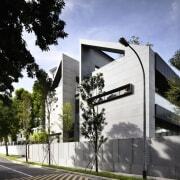 The two wings of this large family home by architects Ong&Ong are clad with different materials to help break up the mass of the building. 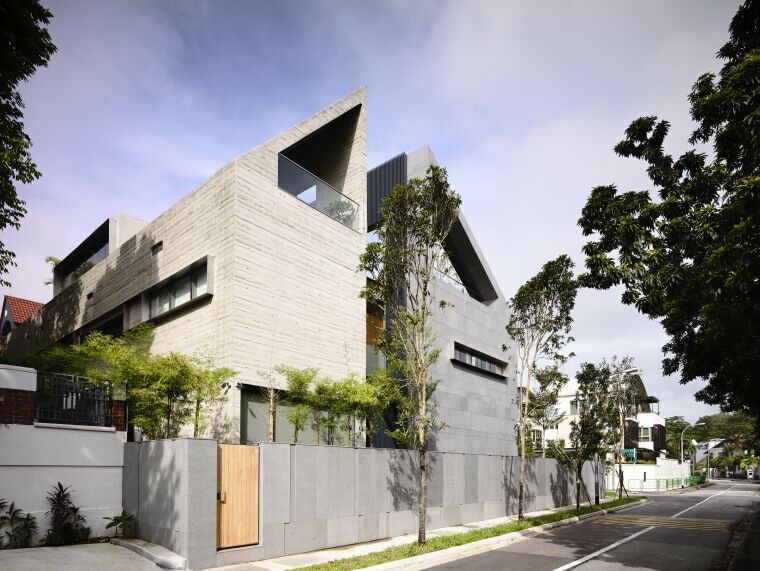 The wing on the left is clad in fair-faced concrete, while the one on the right is clad in granite. One of the challenges when designing a substantial family home is how to create all the spaces the owner wants without giving them a large box with no light in the middle. 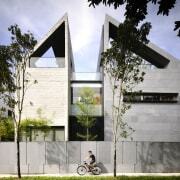 Ong&Ong architects Maria Arango and Diego Molina's solution for this home was to divide it into two wings. 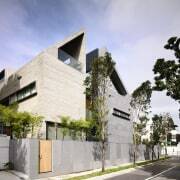 While this in itself is not an unusual approach, the way they've implemented it has produced a house full of contrasts and surprises. "We started with a barn-like structure but didn't want a dark interior," says Maria Arango. "So we opened up the centre with a water courtyard that contains an ornamental reflecting pool." 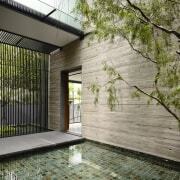 The two wings that wrap around the water courtyard divide up the functional spaces of the house and feature different cladding materials. The living area on the ground floor of the front wing of this large family home can be fully opened up to the courtyard pool on one side and the garden and swimming pool on the other, ensuring cross-ventilation to keep the house cool. The front wing contains the living and dining areas on the ground floor with the master bedroom and family room above. While the rear wing contains more of the services such as the kitchen, family dining, maid's room and a study. "Having both wings in the same material would have been boring and given them the same importance," says Arango. "To establish a different hierarchy and to help break up the mass, the front wing is clad in granite while the rear wing is clad in fair-faced concrete." 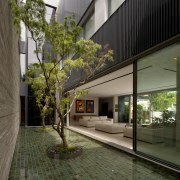 The water courtyard between them forms a focal point of the home. 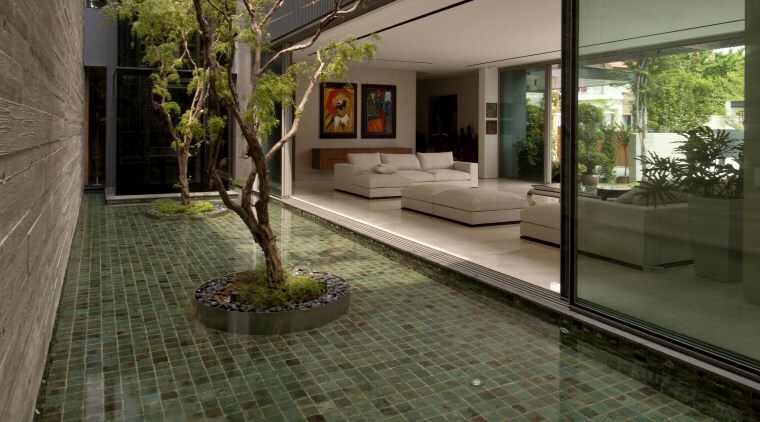 It is planted with two willow trees, bringing greenery into the house, and allowing indirect natural light into the living area. But the most impressive feature of the home is the way glass panels on both sides of the living and dining rooms can slide back to completely open them up. Opening up large glazed panels allows a seamless flow between the lap pool, outdoor living area and the interior living and dining areas in this new home. 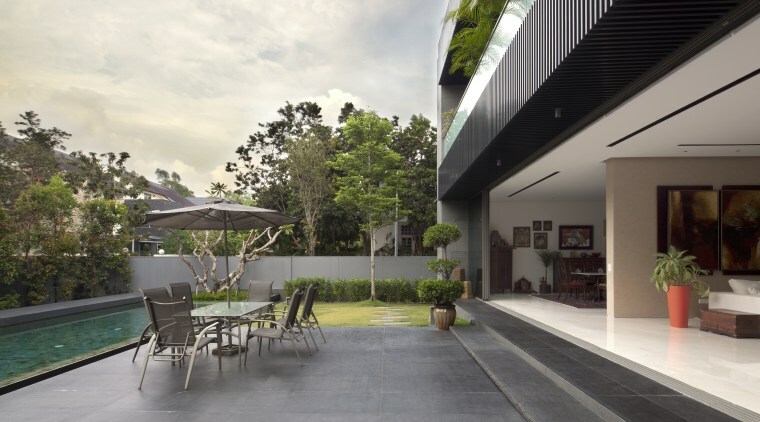 This creates a seamless transition between spaces, starting from the lap pool and garden at the front, to the front wing living room, through the courtyard and all the way to the kitchen in the rear block. 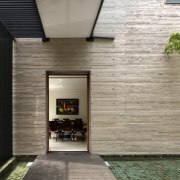 The void of the central courtyard also ensures cross-ventilation throughout the house. As hot air rises here, it pulls cooler air into the various rooms creating an efficient internal circulation system.